A former vineyard (this is what “Vinohrady” means in Czech), the Vinohrady district has changed dramatically over the years. The neighborhood was once synonymous with the Prague bourgeoisie, but has become a hub for expats and hipsters and is now one of the most popular places to live and go out. What do you know about Vinohrady? 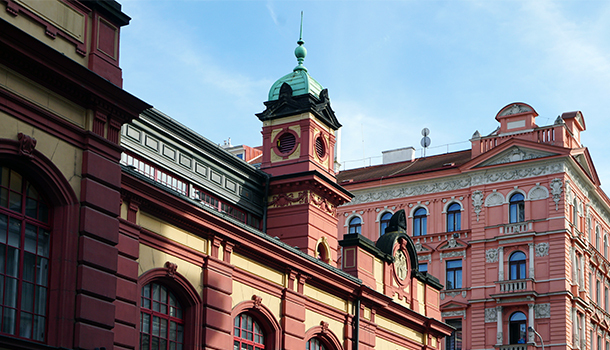 The University of New York in Prague perfectly located in the heart of Vinohrady. You’re just a short walk away from everything you need, so find some landmarks and get out there! You will become a local in no time. From parks and markets to cycle lanes and cozy coffee shops, Vinohrady has something for everyone, and this convenient, safe and inspiring district will set you up for success during the semester. Vinohrady is a place that locals prefer to keep for themselves, so even during high season, you won’t see crowds of tourists here. Vinohrady has a lot to show you: exceptional architecture, fun, friendly and cheap bars, an eccentric and hip crowd, great food and fantastic indie design shops. What should you see in Vinohrady? 1. We love the parks, and the “park season” starts in spring and often lasts until the end of October. The most beautiful park in Vinohrady is the Italian Renaissance-inspired Havlíčkovy Sady, which has fountains and water cascades, little lakes, statues, and a beautiful cave, as well as a magnificent view of the city from the Grebovka Pavillion. It is an excellent park for a morning run, an outdoor yoga session, a book on a bench or a wine tasting at Grebovka Pavillion during the French culture appreciation week. 2. Riegrovy Sady is a larger park which is more suitable for watching the sunset. "Riegrák" is where all the locals come to relax and sunbathe in the summer! This park is very popular with dog owners, and just as convenient for running and jogging. The beer garden in Riegrovy Sady has an outdoor screen where football and hockey can be watched. 3. Namesti Miru is one of the prime locations of Prague’s famous Signal Festival, which takes place between 11th and 14th of October this year. A highly complex light art concept brings the exterior walls of the Neo-Gothic St. Ludmila Cathedral to vivid life. You might want to pre-plan this event and book an Airbnb in the opposite building across! In mid-December, this little square becomes a cheerful Christmas market which reflects the local culture with its traditional foods and drinks, festive handicrafts, and carols. 4. Moving along, Kino Pilotů is technically located in the neighborhood district of Vršovice, but we mention it here because it is so close to our campus. This cozy cinema presents a great variety of conceptual and indie movies, together with contemporary blockbusters. Pilotu is a beautiful place to catch the late-night film on a break between midterm papers. 5. Successfully finished the fall semester and already packed to go away for Christmas? An excellent excuse for indulging in a "svařák" 66 meters above the ground in the Žižkov Television Tower bar. By the way, did you know that Žižkov was a part of Vinohrady until 1881? Of course, there is a lot more to explore, and these are just a few examples to get you started. Whether you are living in Vinohrady or just studying here, walking around this district is always a delightfully peaceful part of life in Prague.